Croatia maps from Omnimap, an international map store with over 250,000 map titles. Croatia Travel and City Maps. Croatia & Slovenia Road Atlas. 1:150,000 (Croatia & Slovenia) & 1:3,500,000 (Europe). Freytag & Berndt. A very detailed road atlas with spot elevations marked, distances between villages shown, individual buildings shown in some cases, thousands of tourist sites and services noted, etc. Spiral-bound. Croatia Road Map. 1:500,000. National Geographic Maps. National Geographic's Croatia Adventure Map will meet the needs of travelers with its detailed, accurate information. The map includes the locations of exotic places to discover including Trogir, Dubrovnik, and Mostar, with a user-friendly index, clearly marked road network complete with distances and designations for roads/highways, plus secondary routes for those seeking to explore off the beaten path. Croatia Road Map. 1:500,000. Freytag & Berndt. Multilingual. Excellent single-sheet road map of Croatia and Bosnia/Hercegovina. Covers nearly as much territory as the map below. Sketch map showing area covered by the Croatia map. Croatia Road Map. 1:750,000. Michelin #757. A good road map of Croatia done in Michelin's famous map style. The map scale is smaller (slightly less detailed) than the Freytag/Berndt map above, but the paper size is slighly smaller so a little easier to handle in the car. Croatia, Slovenia, Bosnia & Hercegovina Road Map. 1:500,000. Freytag & Berndt. Multilingual. Excellent single-sheet road map of Croatia, Slovenia, Bosnia & Hercegovina. Sketch map showing area covered by this map. Serbia, Slovenia, Croatia, Bosnia, Herzegovina, Macedonia, and Montenegro Travel Map. 1:600,000. Freytag & Berndt. This detailed road map covers all of the former Yugoslavia. Shaded relief shows elevation, roads are clearly marked, and tourist sites and services are marked. Multilingual legend, including English. Dalmatia Road Map. 1:175,000. Reise Know-How. Dalmatia Road Maps. 1:250,000. Gizimap. This double-sided map covers the entire Dalmatian and Slovenian/Croatian coast from Trieste, Italy, through Istria to Podgorica in Serbia/Montenegro. Multilingual with English. Road detail includes minor roads and tracks, and intermediate driving distances are marked on main routes. Railways and ferries are marked and national parks are shown. Symbols denote airfields, ports, frontier crossings, places of interest, museums, natural sites, spot heights, pass heights, landmarks, antiquities, diving spots, campsites etc. The road map has shaded relief; the geographic map has elevation tinting. We recommend the road map for driving (easier to see the roads on the map), the geographic map for wall maps or those interested in the terrain. Please see the two sample links below to see the difference. Sample detail from the Dalmatia road map. Sketch map showing coverage of the Dalmatia maps. $14.99 65-69917 1 sheet, folded. $19.99 65-69917R Wall map, flat. $36.99 65-69917L Wall map, laminated. Dalmatia Geographic Maps. 1:250,000. Gizimap. Sample detail from the Dalmatia geographic map. $14.99 65-69918 1 sheet, folded. $19.99 65-69918R Wall map, rolled. $36.99 65-69918L Wall map, laminated. Istria Road Map. 1:70,000. Reise Know-How. 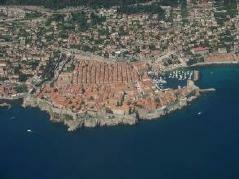 Croatian Coast Road Map - Istria-Dalmatia-Dubrovnik. 1:200,000. Freytag & Berndt. A detailed double-sided map of the entire Croatian coastline and the offshore islands. The map uses shaded relief to show elevation, has distances between major road junctions, and uses symbols to locate tourist sites and services. Multilingual legend. Sample detail from the Croatian Coast map. Northern Croatia Road Map. 1:200,000. Freytag & Berndt. A detailed single-sheet map that covers northern half of the country. It covers the Croatian coast as far south as Zadar. This covers the eastern part of Croatia not covered on the 'Croatian Coast' maps. Croatia & Dalmatia Coastline & Istria. 1:100,000. Freytag & Berndt. Good quality road maps of this up-and-coming adventure travel region. Some of the best sailing in all of Europe is through the island waterways along the Dalmation coast. Multilingual. Sketch map showing the coverage of each map in this series. $14.99 65-69910 Dalmatian Coast map #1 - Kornati Island & Zadar. Sketch map showing coverage of the Dalmatia map #1. $14.99 65-69911 Dalmatian Coast map #2 - Sibenik-Split. Sketch map showing coverage of the Dalmatia map #2. $14.99 65-69912 Dalmatian Coast map #3 - Brae-Hvar-Split. Sketch map showing coverage of the Dalmatia map #3. $14.99 65-69913 Dalmatian Coast map #4 - Mljet-Dubrovnik-Medjugorie. Sketch map showing coverage of the Dalmatia map #4. $14.99 65-69914 Istria Peninsula map. Sketch map showing coverage of the Istria Peninsula map. Zagreb City Map. 1:20,000. Freytag & Berndt. Large, indexed street map of Zagreb from Freytag & Berndt, covering the city with its outer suburbs and surrounding villages at 1:20,000. City center shown on reverse in greater detail at 1:10,000. Both sides shows tram routes with line numbers and stops, plus an additional a diagram of the whole network. Croatia City Topographic Maps. NIMA. These are topographic maps of cities, not tourist street maps. These maps show contour lines, spot heights, often show power lines, building footprints, etc. In some cases they are the best map available for that city. In English. Sample of the Rijeka map. $24.99 65-6992DU Dubrovnik city map. 1:12,500. 1993. $24.99 65-6992OS Osijek city map. 1:20,000. 1993. $24.99 65-6992RI Rijeka city map. 1:12,500. 1993. $24.99 65-6992SL Slavonski Brod city map. 1:12,500. 1995. $24.99 65-6992SP Split city map. 1:12,500. 1993. $24.99 65-6992ZD Zagreb city map. 1:25,000. 1995. Walks in Croatia guidebook.. Cicerone. The routes in this guide cover all the main hiking areas in Croatia, from the Dinaric Alps along the coast to a number of other areas further inland and to offshore islands. Catering for a range of abilities, they run from easy day trips on islands in the Adriatic to extended itineraries across jagged mountain chains. The book also contains generous background information, including sections on history and language, and appendices giving details of mountain huts and shelters. Shows a summary map for one of the treks. Islands of Croatia hiking guidebook. Cicerone. This guidebook provides 30 day walks on the islands of the Croatian Adriatic, ranging from short, easy coastal strolls to more challenging, full day outings over rocky ridges and summits, with spectacular views of the Dalmatian coast. Featuring routes on 14 Croatian islands, including the islands of Hvar and Mljet, as well as quieter islands. Former Yugoslavia (including Croatia) 1:50,000 Topographic Maps. NIMA series M709. 3rd edition, 1995. This series offers nearly complete coverage of the former Yugoslavia; 389 of 419 sheets are available. The sheets are nearly all 1995 or newer and all are in English. Index map. Yellow sheets are available. Click here to order individual sheets. $3.99 67-1070CRO Croatia flag, small. Size 4 x 6 in. $74.95 67-1073CRO Croatia flag, large. Size 2 x 3 ft.